Medical Officer, Lab technician, Social Worker, KMC Support worker, AMO, Psychiatrist, and more vacancies in this DHFWS Panipat NHM recruitment. All these DHFWS Panipat District vacancies are under NHM, RHSK, DMHP and Urban Health Mission. For each post written exam and interview will be conducted as per given dates for of DHFWS Panipat NHM Recruitment 2017. Walk in interview for this Staff Nurse, ANM, Medical Officer and other jobs will be conducted from 19-12-2017 to 22-12-2017. 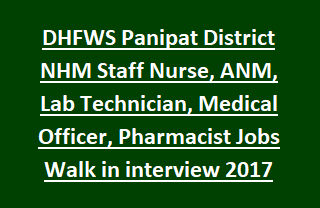 More details regarding DHFWS Panipat recruitment of Staff Nurse, ANM and other jobs post wise vacancy, walk in in interview dates are given below. For Staff Nurse Jobs-GNM Diploma Course qualification required and must have registered with Haryana Nursing Council. For ANM, KMC Support Worker Jobs-ANM Course qualification and must have registered with Haryana Nursing Council. For KMC Support Worker upper age limit is 40 years. For all other posts upper age limit is 55 years. Candidates will be selected through written test and walk in interview. Written test will be conducted on the same day of walk in interview depends upon the applicants attended. It is a walk in interview so candidates have to attend the walk in interview along with all original certificates and a set of photo/xerox copies of all required certificates. Candidates may download the application form from official website of NRHM Haryana @http://www.nrhmharyana.gov.in/. Download Application form here for NHM vacancies of Panipat District Health and Family Welfare Society.